Eileen's Inspiration Team is sharing projects all month long using her Color Blends from ClearSnap. I created a fun "Hello" Card last week on how to make marble paper using the Color Blends which you can find HERE! 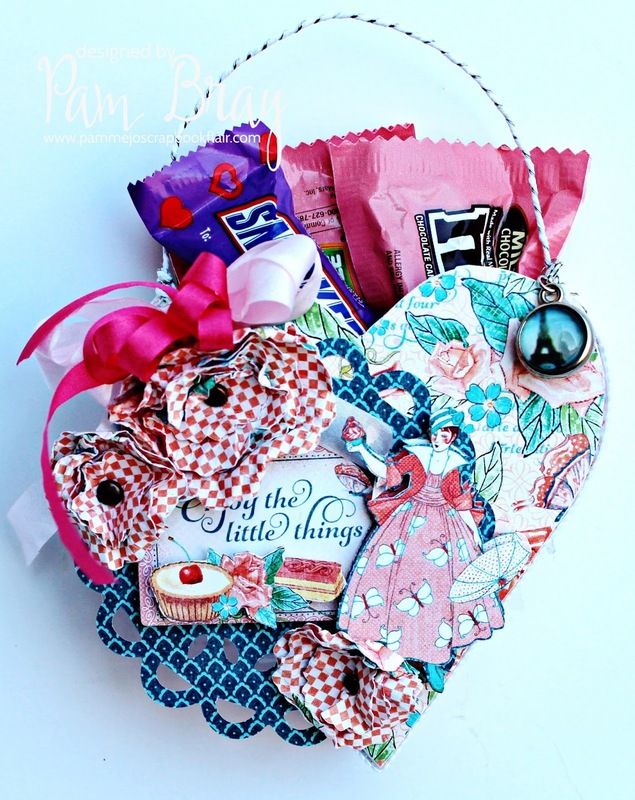 Today, though I am sharing my Valentine Candy Wall Box Hanger using Eileen Hull's fabulous dies from Sizzix. 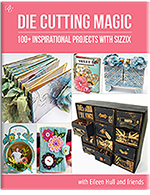 I began by first running my chipboard through my Xyron Creative Station or use your favorite adhesive. Add pattern paper to prepared heart chipboard. Cut 4 of the small folded sections from each of the side pieces. Once the sides are glued on to the heart take the two smaller pieces and cut in half. Adhere to the inside of the heart so the second heart will be able to rest on them when glued. Punch small holes in sides of prepared heart. Add pattern paper and trim to the side of heart. Punch holes out one more time. Using Twist & Style Tool, wire and heavy white twine. Add handle to top of heart box that has been formed. Adhere to top of prepared heart box. Die cut journal piece using label die. Fussy cut second image and add to label die with pop dots; adhere to top of doily. Fussy cut two of the lady images from pattern paper; layer together with pop dots. Die cut pattern paper using Romance Die. Wad flower pieces up while wet. Open damp flower pieces; shape while wet and allow them to dry. Add flowers to prepared box. Make bows; adhere to prepared box along with two of the prepared flowers. Add charm and some of your favorite candies. Pam this candy heart box is so adorable!!! !